Packaging anti-cancer drugs into particles of chemically modified silica improve the drugs' ability to fight skin cancer in mice, according to new research. 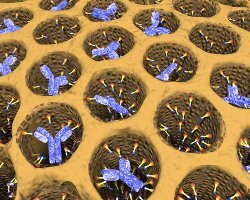 Results published May 3 in the Journal of the American Chemical Society online show the honeycombed particles can help anti-cancer antibodies prevent tumor growth and prolong the lives of mice. "We are very excited by our preliminary results," said biochemist Chenghong Lei of the Department of Energy's Pacific Northwest National Laboratory, part of the team of PNNL and University of Washington scientists. "We plan to do some additional, larger studies with animals. We hope the results hold up well enough to take it to clinical trials somewhere down the road." Read the PNNL press release. Acknowledgments: This work was supported by PNNL, Washington Research Foundation, University of Washington, the National Institutes of Health, and the U.S. Department of Energy Office of Basic Energy Sciences. The research was done by Chenghong Lei, Baowei Chen, Heather Engelmann, Yongsoon Shin, and Jun Liu of PNNL and Pu Liu, Yumeng Mao, Jade Jaffar, Ingegerd Hellstrom, and Karl Erik Hellstrom of the University of Washington. Reference: Lei C, P Liu, B Chen, Y Mao, H Engelmann, Y Shin, J Jaffar, I Hellstrom, J Liu, KE Hellstrom. 2010. "Local release of highly loaded antibodies from functionalized nanoporous support for cancer immunotherapy," Journal of the American Chemical Society, DOI 10.1021/ja102414t.